Step 1 For the yogurt sauce: In a small bowl, combine the yogurt, garlic, cilantro, parsley, dill, lemon juice, salt, and pepper. Stir to combine. Step 2 For the falafel: In a food processor, pulse split green peas, garlic, onion, cilantro, parsley, flour, cumin, lemon juice, salt, and pepper until it turns into a coarse meal, not mushy. Step 3 Stir everything together, and transfer into a bowl. Step 4 Take 2-2½ Tbsp of mixture and roll them into a ball, and slightly flatten them. Continue with the remaining mixture, and set it aside. Step 5 Heat a large pan with oil. Pan-fry falafel for 3-5 minutes on each side, until golden brown on both sides. Step 6 Remove from heat, and serve with the yogurt sauce. 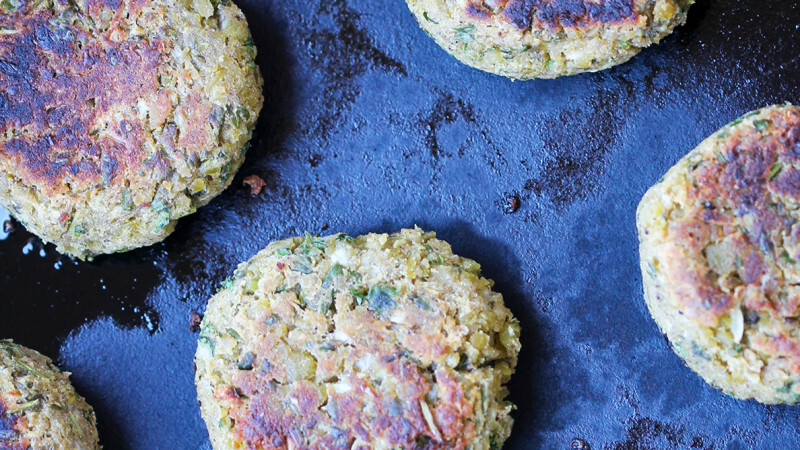 These pan-fried falafel balls only use 2 Tbsp of oil to achieve a crispy, savory flavor you’ll crave. Serve with a chopped salad or stuff in a whole wheat pita with yogurt sauce for a deliciously balanced meal.